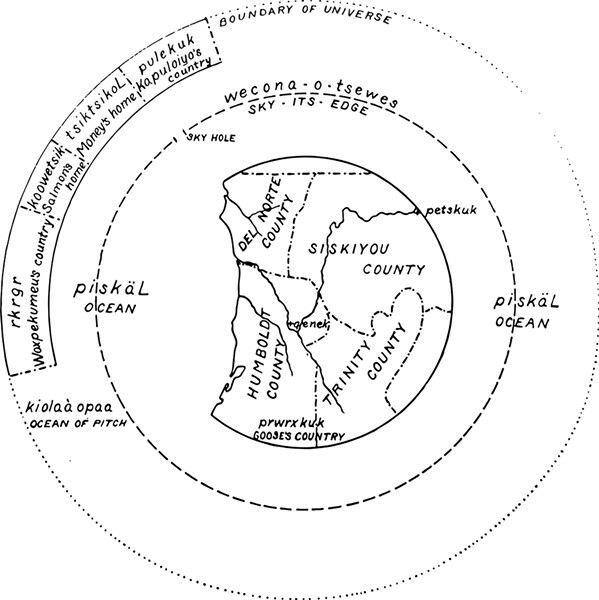 From T. T. Waterman's 1920 book Yurok Geography A map of the universe indicating Qenek, the Yurok word for Katimin, at the center. Photo by Gabrielle Gopinath A view of Auitch at the site of Katimin village. Photo by Jayme Kalal Brian Tripp by the Klamath River near Ishi Pishi Falls after fishing for Chinook salmon. Photo by Sam Armanino Tripp explains the geography of "The People are Coming" at the California Living Heritage Award ceremony. Photo by Drew Hyland An example of Tripp's work. I saw the place the Karuk call the center of the world in a painting before going there for real. It was marked with a sleek isosceles triangle, blue magic marker on tinfoil — an emphatic shape that lingered in the mind. Standing before his painting, Brian D. Tripp turned to me in the oaken splendor of the ballroom at Eureka's Historic Eagle House, stained-glass eagles refracting the light overhead, and explained, "That's our mountain, Auitch. At Katimin." His hand swept an arc across the shiny surface, following the path of the wide blue vertical band that slices in between a small, perfect blue triangle and its larger neighbor to the left. "There's the river and Ishi Pishi Falls just below." He smiled gently. "It's the center of the world." It was Oct. 4 and soon more than 200 guests would gather to honor the Karuk painter, sculptor, poet, traditional singer and indigenous peoples' rights activist at a ceremony to celebrate his receipt of the California Living Heritage Award from the Alliance for California Traditional Arts — only the third time in the Fresno-based nonprofit's 20-plus year history that its highest honor for lifetime achievement had been presented. It was early, the ballroom still mostly empty. Tripp, outwardly gracious and expansive but inwardly, he confided, "nervous," passed the time by talking a few bystanders through a landmark painting he made in 1989, explaining how its hard-edge motifs spoke to features of Karuk geography. Tripp made the scene in the late 1970s and 1980s, when he started exhibiting graphic paintings executed in a language of hard-edge geometry that drew upon the traditional language of abstract form that had been used for millennia by Karuk basketweavers, adapting ancient designs with names like "cut wood," "long worm," "snake nose" and "snail back" to a modern medium and purpose. Unlike most Western forms of abstract art, Tripp's forms were never divorced from the land; his geometry is always founded in geography. Both his work and his life are tied to the Karuk people's traditional task of world renewal. "The People are Coming" is long, flashy and compact, like a fast car. It was made using paint and marker on tinfoil. It is packed with hard-edged, jewel-toned shapes. The reflective foil surface lends luminescence to greens, reds and blues, making them pop against a matte black ground. "'The people are coming!'" Tripp exclaimed. "That's what they said to one another before they left: 'The people are coming.' And before they left, they literally gave us the keys to the city. They explained to us: 'If you don't do this, if you don't do that'" — he waves his hand around, indicating the whole of ritual observance — "'This is what happens.' And then they left. But the rocks and the trees contain the messages they prepared." Tripp continued, "We are different from the people who were there before us." He was alluding to ikxareyavs, the superhuman race of shape-shifting spirit people whose epic doings, chronicled in Karuk myth, shaped the world before humans arrived on the scene. "They knew how to do the stuff it took to make the world, to keep the world in balance through all the little twists and turns." I considered the Karuk world as I had read it described: something like a vast covered basket suspended in a current, rising and falling ceaselessly on the celestial flow. The world's constant motion means that, like a boat, it needs to be tended to with a continuous flow of precise adjustments. Ceremony is how those adjustments are made, how people keep the world's balance in trim. The tiny ceremonial village named Katimin is one of the places where those rites have always been performed, at least since people entered this part of the world. It is sited where the Klamath and Salmon rivers meet, just beneath the pyramid-shaped crag Auitch, which Tripp had rendered as an electric blue triangle. It's not the artist's true point of origin, as he reckons it — that would be Ameekyáaraam, also known as Ike's Falls, which is only about 10 miles upriver. Tripp described the importance the place holds in his family's history. "The whole world is divided up into sections. Our stretch is upriver. My mother was from about 2 miles below there," he said, indicating the fluorescent blue belt laid straight between jagged mountain peaks. 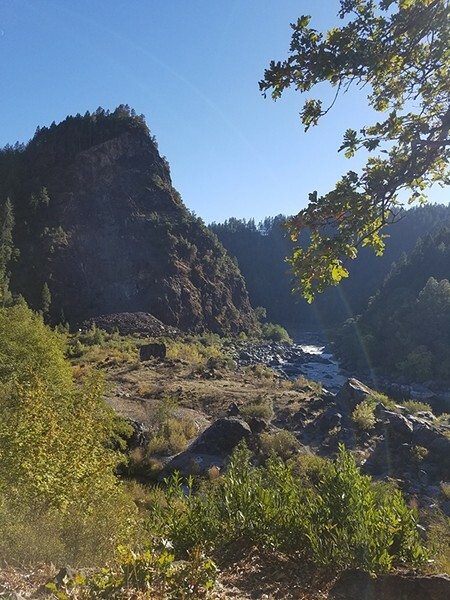 Katimin is about 10 miles downriver, where the Salmon River runs into the Klamath. And it's the center of the Earth — not just in myth," he emphasized, "It's a special place in terms of the magnetic flows, the flows of energy that go through the earth. A powerful place. When you see it and you see that triangle pointing up, and the river below, you can't help but take notice. You can't help but feel something." Tripp was born in Eureka in 1945. His Karuk parents had moved there when his father took the first of a series of logging jobs, felling timber and working in the Eureka sawmills (he would be killed in a logging accident in 1962). The family lived "with the Yurok people on the coast," as Tripp put it, first in Eureka, later in Blue Lake and Klamath, several hours travel from Karuk lands. The distance was not great but it mattered. Tripp's parents raised Brian and his siblings to be aware of their lineage, conscious of themselves as being from, and in some sense of, another place. "Mom and Dad would take us home every chance we got. It took six hours to drive from Klamath to Somes Bar back then; it takes two hours now. We'd leave about six o'clock in the evening, after dad got off work at the sawmill, and we'd get up there by midnight." There were "only about 500 people living in Klamath in the 1950s. Klamath, Smith River and Crescent City were the main towns. There was an Air Force base then, and they mixed a little bit with us locals; married all the girls," Tripp recalled. "It was, pretty much, good times. Swimming, being with the Yurok people, dancing. People who put on dances always invited me into their dances and let me look at their stuff, their regalia, because they knew I was an artist." Friends in Klamath teasingly called him a "Coastal Kay-rock," mangling the pronunciation. 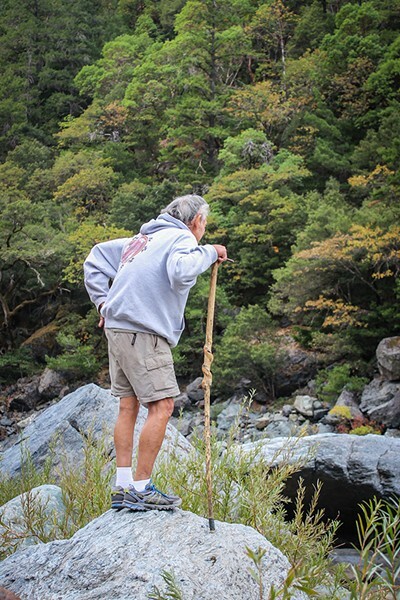 He was a living oxymoron, or a koan of sorts, since the word Karuk itself means "upriver." The Karuk are set apart by their ancestral tie to places of ritual significance that are recognized by Native peoples throughout the region as places where divine forces move. Self-described as the people from the center of the world, they are also the people whose traditional responsibility it has been to fix it. The verb píkyav in their language means "to repair," or "to fix;" traditional spiritual practice revolves around a set of ceremonies for world renewal held annually, collectively called pikyávish. Pikyávish cannot be done just anywhere; it needs to be done at the most spiritually significant sites in Karuk lands. None of these places is more sacred than Katimin, which overlooks the confluence of rushing rivers that centers the Karuk world. Like the dozens of other indigenous villages that flourished along the region's great rivers prior to Gold Rush-era contact with colonizers, Katimin dwindled after contact and was eventually abandoned as a place of residence. Starting early in the 20th century, world renewal ceremonies were not performed here for 50 years. Tripp and his brother David, revered in his own right as a traditional singer and dancer, played instrumental roles in the successful 1980s-era effort to renew the ancient Brush Dance and Jump Dance pikyávish ceremonies. The village site above the river now has a traditional dance pit that is used at regular renewals of those events, which are attracting increasing numbers of participants. "By the early '80s, it was 50 years that these ceremonies hadn't been held. But they were never forgotten," Tripp said. He recalled seeing the possibility of bringing the dances back when he realized "the regalia was still alive, even if the dance wasn't. You just never saw it during this time. It would be hidden away in people's houses, in trunks or up in the attic. But it was the real deal. Featherwork, abalone. Shells. Woodpecker scalps. All kinds of red feathers." He became convinced that the people in his community needed, for their own sake, to resume their stewardship of the world renewal rites. "The Brush Dance is performed to heal a sick person. Could be a physical illness but sometimes, most often, it's mental. An illness of the spirit. So it became a healing thing and a real social kinda time, too. Everyone who was dancing and singing fasted before the dance — they'd go up in the mountains and pray beforehand. That helped. People would show up for the Brush Dance and bring whatever they got: feathers, regalia." This dance, called into being by the family of the sick person for whom it is held, is traditionally more improvisational and has looser regalia requirements than more formal world renewal ceremonies. Everyone is involved. Those not dancing or singing as soloists chant quietly in the background, rocking in unison as the tempo builds. "Everybody is supposed to move in rhythm. The songs are like prayers. You know when the voices blend together, all guttural in the background? That's when you know the medicine is working." "Because of Uncle Brian," Tripp-Allen concluded, "we know that we are these people." She remembered painting pictures as a child with her young cousins, all the kids trying to imitate their famous uncle's art and falling, in retrospect, comically short. "We'd put a triangle and a couple designs on a piece of paper, and we thought we were artists like Uncle — and he always treated us as such." "All the geometric art that people in Northern California have done for centuries — here's this kid, high school class of 1962 in Del Norte, taking an art class from Rick Bennett, and it energizes him — and in 20 years, he has figured out a new and completely different version of the geometry," marveled sculptor Robert Benson, of Tsnungwe ancestry. Tripp's abstraction is intimately connected to indigenous geography, which is imbued with meaning via myth. The result: a prolific body of artwork that can "express longing and urgency, telling stories that talk about survival: tricksters, gamblers, anger, the ability to forgive. Stories we wouldn't be able to hear any other place. What Brian's work did for me, as a person and as an artist — it aroused a voice that said, 'Get to the care of your people. Get to the care of your place on this earth.'" "Brian Tripp has inspired the next generation to take responsibility for maintaining traditional lifeways," said Amy Kitchener, ACTA's director. "And he's not only interested in visual art — he's equally passionate about traditional methods of fishing and the ways of the river. He's passionate about spearfishing for eel in the traditional manner. It's not just the object with him but also the ways of knowing that surround the object. He's interpreting the knowledge of the generations for his time." Malcolm Margolin, Berkeley-based publisher of Heyday Press and News from Native California, spoke about the profundity of Tripp's connection with the people who were the original occupants of this land. "His generation grew up knowing older people who would definitely break your heart," he said. "Shan Davis. Charlie Thom. Elizabeth Case. And they themselves were raised by people who were — I don't think the world will ever see people like that again. There was an edge of violence to them and an edge of beauty. They understood the power of the world in ways that probably no one ever will again." Tripp may well have inherited certain of those ancestors' qualities; it's certainly true that legends tend to follow him. He's the notorious BDT, celebrated locally for many feats, including his habit of trading paintings and sculptures for cars — once classic models from Detroit, more recently, the S.U.V. he still drives. 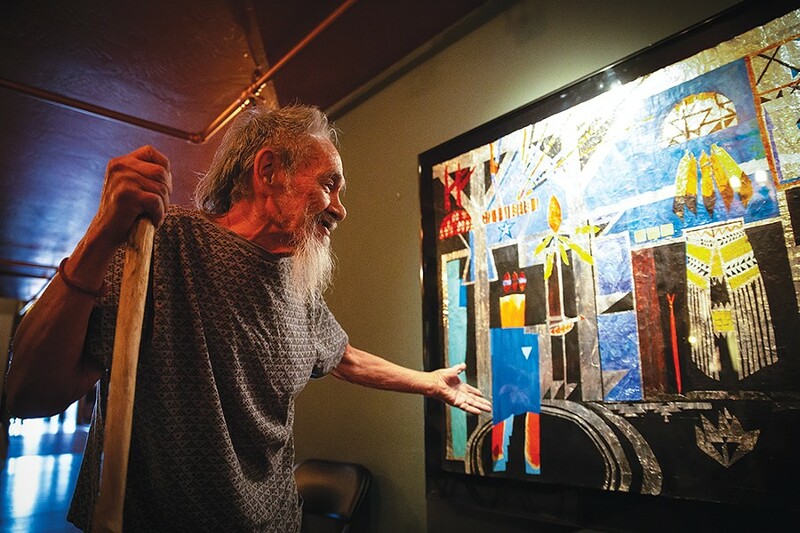 Yurok writer Chag Lowry recalled an encounter in the 1990s: Tripp was exhibiting his paintings on the street in Eureka in conjunction with some event when Morris Graves, famed expressionist painter and Loleta resident, happened to walk by. Graves caught sight of the work, looked long and hard (Lowry's body language when he told the story allowed listeners to imagine the twirling of the mustache, the stroking of the chin), announced to his companions: 'This man has the true art spirit!'" After that encounter, Lowry says, Graves paid Tripp's studio rent for a year. Tripp's abstract paintings have become iconic, as have the sculptures made from driftwood and river rock that have occupied him in recent years. His house in Orleans stands out because of the towering stacks of driftwood and river rock lining the driveway. Tripp hand selects each piece from the Klamath River bar on his daily walks, picking out the ones with gnarled surfaces in which tiny, elfin faces seem to be grinning or grimacing. "Spirit people," the artist explained. Some of these will eventually turn into sculptures. Tripp sees them as already potent with significance. "When you walk out here you see the faces, the eyes, and they're all staring at you," he said with satisfaction. "His style is so individual and so recognizable," Kitchener told me. "It has influenced younger artists from the region in a profound way. His style has almost become like a brand or trademark for this part of California, the true north." Fewer people are familiar with the radical dimensions of Tripp's work, including his history of activism on behalf of indigenous rights and his outspoken belief in indigenous sovereignty. Yet, from "In No Uncertain Terms" and "Taking Care of What is Mine" to "One Day We Will Have to Fight for What We Believe In," his poems, texts and titles pull no punches. 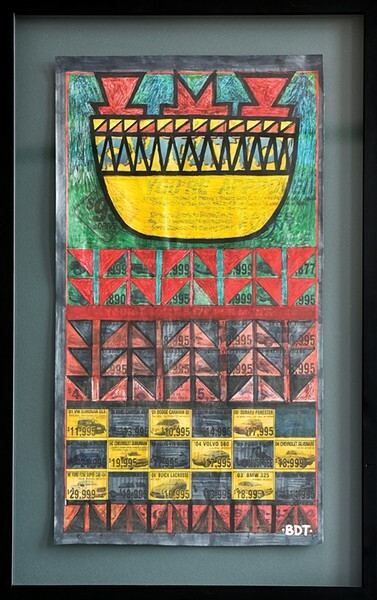 Libby Maynard, an ACTA board member, remembered that Tripp had accepted an invitation to travel to Japan to speak about his art in the 1990s, but making travel plans proved difficult. "He wanted to travel with a Karuk passport. Or if not Karuk, at least a Native American passport." Bureaucratic deadlock and frustration ensued when, despite multiple formal requests, "that didn't happen." Some artists, Maynard concluded, "position themselves in a careerist way;" others, like Tripp, "have an almost anti-success mindset." When Tripp was poised on the brink of mainstream art world recognition in the early 1990s, with a string of solo shows at major institutions, Maynard's perception was "he pulled back." He canceled a show at the Heard Museum in Phoenix, Arizona, throwing his energies into the renewal of dance ceremonies at Katimin and other sites instead. "I think he felt that pursuing art in a national or international context took him far afield from where he wanted to be, which was making art that served this particular community." "I was raised with these ideas," Tripp began when it was time for him to speak. "That it was good to take care of your family every day. That it was good to take care of your people every day." He paused. "Who would have thought that we'd be singing, in this place here? Eureka used to be pretty notorious." He alluded to 1860, the year of the "Indian Island" atrocity, in which a mob of white settlers from Eureka snuck up and slaughtered between 80 and 250 Wiyot people during their world renewal ceremony on the island they called Tuluwat, in Humboldt Bay. "It was rough times. We were being pushed off our land. And as for the old people — everything they'd known their whole lives was gone, or was no longer available to them." He spoke a few lines from one of his poems. Taking State Route 96 past Orleans toward Katimin, you get into a rhythm pulling the steering wheel all the way over to one side, then the other as the road skirts crags and cliff faces, following the switchbacks of an old mule trail through the mountains. The Klamath sparkles darkly far below. Past the road's shoulder, in some places, there is only air. One part of the guardrail is piled high with plastic-sheathed bouquets left there for the victims of a fatal accident the night before; "no skid marks," a cop had said at the Somes Bar Store. Tripp was driving ahead of me in his small S.U.V. when an apparition floated into view in the passing lane: a white Mustang convertible with Native teenagers in the front and back seats. They looked devastating in their mirrored shades, their long black hair whipping in the wind. The car drifted over in the direction of Tripp's small S.U.V., and they both pulled over. BDT hung his head out the window to confabulate. I heard his dry laugh. Whatever he said must have been funny because the kids erupted in hilarity. Voluminous clouds of blue smoke swirled from the vehicles. When I arrived in front of the rock called Auitch, the connection between the flat blue triangle in Tripp's painting and the pyramid-shaped crag before me was clear. The Klamath went rushing through a series of rapids below. Katimin's dance pit was at our backs. Tripp sighed with annoyance at the sparse crop of fir and tanoak burring the peak. "In the old days," he said, "They didn't have all that brush up there. It was all cleared out." He considers any vegetation that impedes his ability to perceive the faces the mountain might present superfluous. "Imagine if other holy sites were covered up in such a way," he said. In his view it was as if ivy had been allowed to obscure the dome of St. Peter's or kudzu to choke the Taj Mahal. Then Tripp sang his Brush Dance song without preamble, talking his way from conversation into melody. His voice, tuneful and sweet, was amplified by the stony walls of the gorge. The river roared in the background. It was an echo of a song that has reverberated at that site for thousands of years, in sync with the landscape that had shaped it. "If you look at the artwork going back to 1980," Benson had said at the award ceremony in Eureka, "if you could find a place that would hold it all and put it there, you'd see that it's all one work: Brian's vision: everlasting and everchanging world renewal." Gabrielle Gopinath is an art writer, critic and curator based in Arcata. She would like to express special thanks to Brian D. Tripp, Malcolm Terence, Susan Ring Terence and Benjamin Funke, all of whom lent vital research assistance.